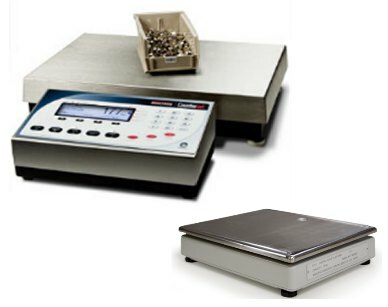 The scale system includes the digital controller below calibrated to the scale platform. The additional scale platform is attached via cable. The system is ideal for virtually any size of small components that you may have since you have a small capacity scale and a large twenty-five pound scale together in one weighing system. Counterpart is loaded with user-friendly features designed to help operators produce perfect results by simply following the keys: zero, tare, sample, and count. The display allows operators to simultaneously view weight, piece weight, description and quantity simultaneously. 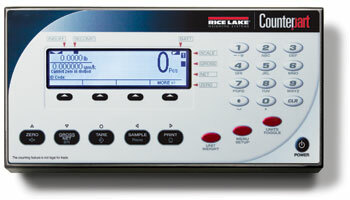 The ten-piece default sample setting and accuracy enhancement features release operators from counting out large samples. Operators can choose display modes, weight/1000 or average piece weight (APW), and work in the mode that’s most familiar. While the Counterpart has infinite power to handle the most complex operations, most counting tasks will be accomplished with a simple touch of a button. Please notice, many years ago this item was a single unit with two platforms. Apparently the dual platform base is no longer available so we have to use two independent platforms in order to make the complete system. The end result is the same when it comes to accuracy and how the scale works. But, it is not "a one piece system" which makes it much less portable. It results in a scale keypad connected to a scale platform and then a cable connects to a second "remote" platform.